Barcelona is extremely densely populated. 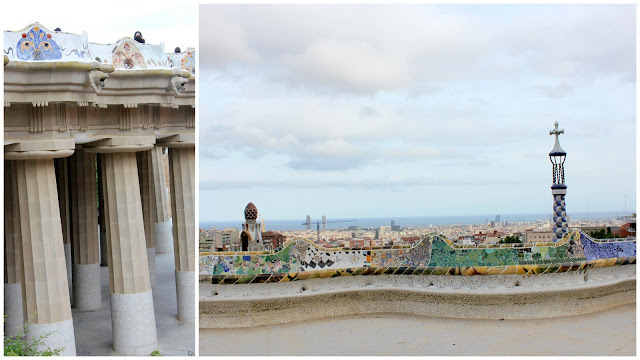 Bordering the city is the Collserola mountain range, and the Mediterranean sea. An architectural style, art noveau, is reflected in the works of the famous Antoni Gaudí. I would describe his style as being very organic, and grandiose, but yet functional, and practical at the same time. Parc Güell is like a huge canvas which gave Gaudí the opportunity to exhibit his unique style. The original plan of Count Güell was for Gaudí to design a place suitable for building houses. He though it was a pretty novel idea, because everyone in Barcelona lived in apartments. Unfortunately the plan never took off as the place is pretty inaccessible, especially during the 1980s when transport was more of an issue. Eventually the place was donated to the government and converted to what we know of today as Parc Güell. At the main entrance you’ll be greeted by whimsical looking guardhouses that look like they popped out from the childhood bedtime story, Hansel and Gretel. Colorful mosaics can be found almost everywhere in the park. Most of them are recycled from unwanted tiles at factories which Gaudí got his workers to gather. Gaudí’s adamant belief that nature is perfection heavily influenced his unconventional designs, where straight lines are almost non-existent. The world’s longest bench for instance, is a wavy one. You’ve also got to applaud the functionality of his designs. The wavy bench allows people to talk to one another without having to turn their heads, and the columns of the market place are tiled at the bottom to facilitate washing. But to me his greatest work was the Sagrada Família, or the Holy Family. The structure is simply breath-taking. 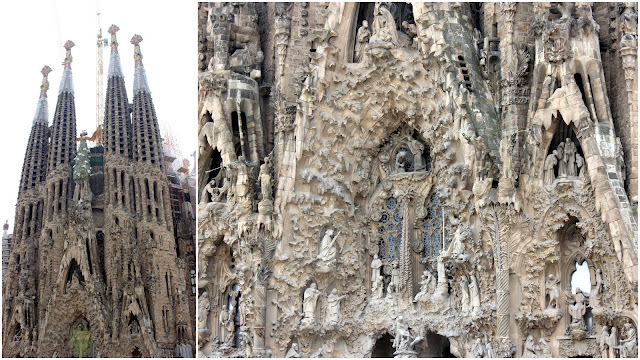 The cathedral was never completed, though Gaudi left behind plans for the entire building. 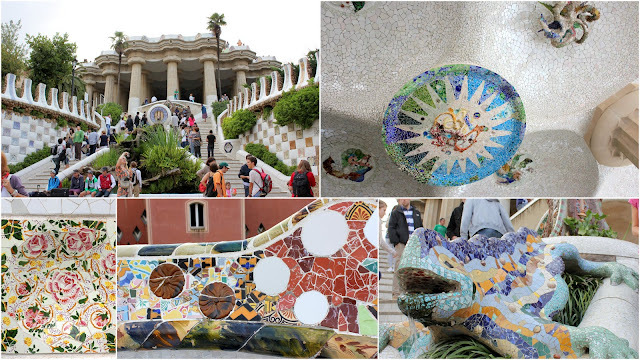 It’s funded by the people, and our guide told us that Gaudi was so passionate about this project that he often went around the area to collect donations, and conduct tours in the parts that were already done to attract more funds. At his death, only the Nativity facade was completed, and this is only the side door to the amazing building. Constructed between 1894 and 1930, the Nativity façade was the first façade to be completed. Dedicated to the birth of Jesus, it is decorated with scenes reminiscent of elements of life. Characteristic of Gaudí’s naturalistic style, the sculptures are ornately arranged and decorated with scenes and images from nature, each a symbol in their own manner. For instance, the three porticos are separated by two large columns, and at the base of each lies a turtle or a tortoise (one to represent the land and the other the sea; each are symbols of time as something set in stone and unchangeable). In contrast to the figures of turtles and their symbolism, two chameleons can be found at either side of the façade, and are symbolic of change. The façade faces the rising sun to the northeast, a symbol for the birth of Christ. It is divided into three porticos, each of which represents a theological virtue (Hope, Faith and Charity). The Tree of Life rises above the door of Jesus in the portico of Charity. 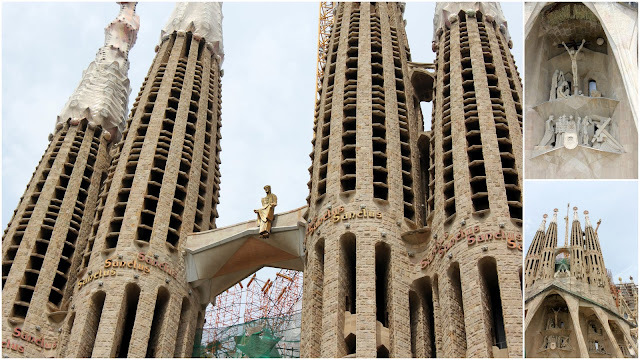 Four towers complete the façade and are each dedicated to a Saint (Matthias the Apostle, Saint Barnabas, Jude the Apostle, and Simon the Zealot). Originally, Gaudí intended for this façade to be polychromed, for each archivolt to be painted with a wide array of colours. He wanted every statue and figure to be painted. In this way the figures of humans would appear as much alive as the figures of plants and animals. The Glory facade, more recently finished, reflects an entirely different character. Of course it must be so because this was designed by another architect by the name of Josep Maria Subirachs. The angular structures and faceless statutes evoke a sense of austerity, and harshness, which reflect the Passion of Christ perfectly. One of my favourite dinners was in the Santiaguino Restaurante. They sell lots of fresh seafood here, which is a must-try when you are in Barcelona since it’s so near the Mediterranean. Basically the server brings up a huge plate filled with fresh seafood, and introduces them to you. You make your choice, tell him what method of cooking you would like, and that’s about it. 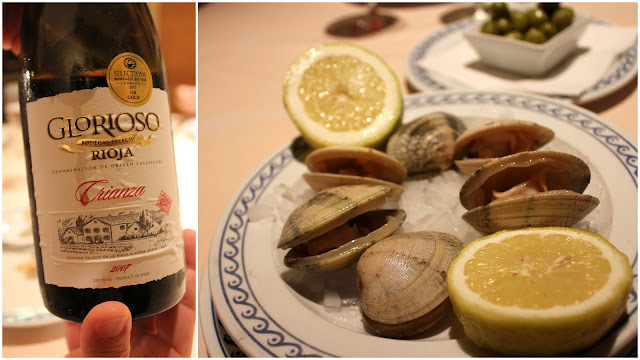 We had clams (Almejas Gallegas) [29 Euros] simply steamed and served with lemons. These were so flavourful with a briny taste and the sourish zing from a squeeze of lemon really sealed the deal. 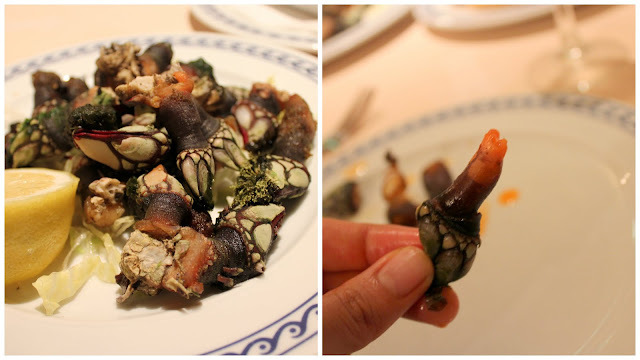 I know, these Gooseneck barnacles (Percebes Gallego) [48 Euros] look awful but they taste awesome trust me. Andrew Zimmern ate this in Bizarre Foods, and as he always says, “if it looks good eat it!”. At first it was really difficult to pull apart the claw and the leathery leg/skin of the barnacle. We eventually got used to it, and my the effort was worth it. The flesh is sweet, juicy, and has a little of the briny flavour that makes all seafood taste good. Again, a squeeze of lemon, and you are good to go. Note that gooseneck barnacles command a hefty price tag, so don’t order too many especially if you haven’t tried it before. They serve baby squid (pulpitos) [28 Euros] everywhere in spain. Steamed, poached, deep-fired, pan-fried- they are all very delicious. Crayfish (cigalas) [18 euros], and huge prawns (gambas) [24 euros] cooked a la plancha (grilled on a metal plate). Merluza or fresh hake [23 euros] is a fish which is very popular in Spain. The cheaper varieties of hake are frozen, while more expensive versions like this one are fresh. I believe we had ours roasted. Anyway, the flesh was nice, and moist, even for such a thick slab. 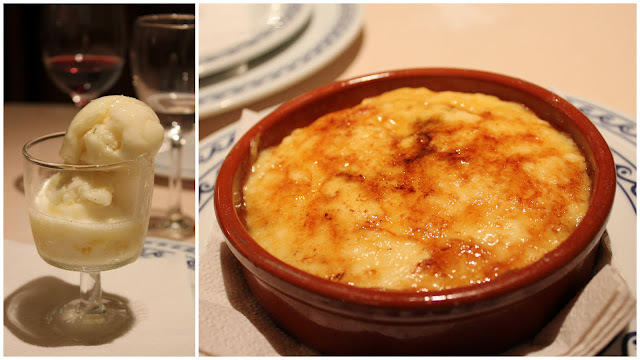 We ended the meal on a sweet note, with pineapple sorbet which was tart and refreshing, and crema catalana, a catalan variation of crème brûlée, the only difference being the cinnamon added to the custard. I had problems with the latter because the custard was a little lumpy instead of a smooth. The burnt sugar crust was not as even or as thin as I would like it to be either, but all in all the flavours were spot-on.